The reflection tape part was easy to break compared with other parts. The price was cheap, so there was something better than this product so it will not be bought in the future. This review is about item#35336874. It is easy to use without troublesome work at affordable price. It seems to be strong against the cold. This review is about item#35336883. Although it was stronger than the one I used so far, I also purchased additional items, but the front part of the Velcro strap will not stick around half a year. As well as the reflection tape recognition, the mesh part is also well visible with vivid orange color and is very good for securing safety. This review is about item#35336901. I think that it is the best bargain durable at this price. It is an indispensable item inside the factory, and it is a replacement of what I used before. Velcro sticker does not stick to unnecessary places, it feels nice. Despite cheap products, I believe that the nighttime reflectance is a product that leads very well to the safety of workers. It is mainly watching activities in blue Pato and watching traffic of children going back and forth. Reflective surface is large and it is effective at night. Because I was purchasing two, I did not order my name. After purchase, I printed and pasted on myself a waterproof film. It is wide, so it stands out very much. It is convenient because you can adjust the size. Very easy to use. ... apparently ... Thank you very much. This review is about item#35336892. I bought it cheaply by consulting with the engineering staff. It was cheaper than the mass retailer, about 30% so I bought it. It reflects fairly and is not high quality, is not it cheap? It is wide and very well visible. It's okay to wear jumpers etc. because it is bigger. I was lucky because the price was falling. 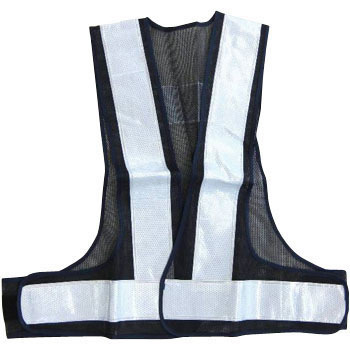 Since the reflecting part is wide, it has a sense of security in a remarkably safe manner than the reflective vest used until now. I think that the feeling of wearing is not bad either.